Why are these three well-known companies miserly with their dividends? Dividend stocks are a great way to build wealth in the long run, but only if you pick the right stocks. Some well-known companies, for instance, pay out only a measly portion of their profits to shareholders in dividends, while others have embarrassingly low yields that hardly match up to inflation -- let alone manage to supplement your income. Three such popular names that could do their shareholders a favor by being a little more generous with their dividend policies are Sherwin-Williams (NYSE:SHW), Visa (NYSE:V), and Advance Auto Parts (NYSE:AAP). Sherwin-Williams comes across as a top dividend stock given its place in the elite Dividend Aristocrats list, which is composed of companies that have increased their dividends for at least 25 straight years. There's no denying the paint maker's dividend record -- it has raised its dividends for 38 consecutive years now. However, Sherwin-Williams stock currently yields a paltry 0.9%, and its forward yield of 1% offers little respite. Blame its low payout ratio of below 30% and the slow growth in dividends. Barring a handful of strong years, the company's annual dividend increases have been small in the past three decades: It last raised its dividend by just $0.01 per share earlier this year. The picture isn't any rosier with Visa. The payments-processing giant that essentially runs a duopoly with MasterCard is minting money, converting more than one-third of its revenue into free cash flow (FCF) that runs into billions of dollars. That isn't really surprising, given its high-margin business -- all Visa does is monetize its network with banks and merchants worldwide to earn fees on every transaction made using its branded credit and debit cards. Yet Visa paid out only around 23% and 30% of its earnings and FCF per share, respectively, in dividends last year. The stock barely yields 0.63% today. The next stock up, Advance Auto Parts, is perhaps the worst of the lot. It might be dominating the auto-aftermarket industry in the U.S., but the $7.3 billion company hugely disappoints when it comes to dividends. AAP Free Cash Flow Per Share (TTM) data by YCharts. To be fair, it's unreasonable to expect high-dividend growth in a cyclical industry like auto. 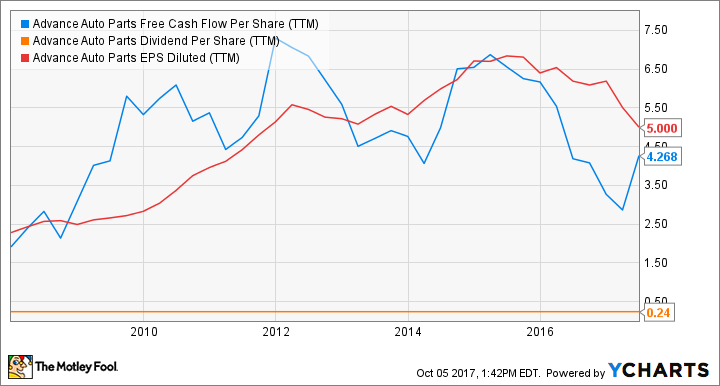 But as you can see in the chart above, while Advance Auto Parts has earned pretty strong earnings and free cash flow in the past decade, its dividends haven't budged since, and payouts remain in the low-single-digit percentages. So what are these companies doing with all the money if they're paying so little in dividends? 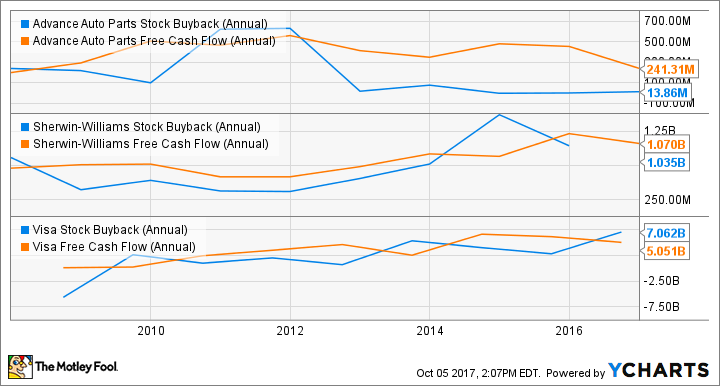 The following chart reveals how miserly Advance Auto Parts has been with both dividends and share buybacks. Sherwin-Williams and Visa, on the other hand, have spent significant amounts of money on repurchases in recent years. AAP Stock Buyback (Annual) data by YCharts. While share repurchases have proven a smart strategy for both companies, as their share prices have skyrocketed over time, I believe shareholders stand to gain more from growing dividends in the long run. The good news is that both Sherwin-Williams and Visa appear to be warming up to the idea. Sherwin-Williams, for instance, expects its dividends to grow at least 50% between 2018 and 2020. Of course, it's not that Sherwin-Williams is about to get a windfall -- those dividend projections are backed by the potential accretion to its earnings and cash flow from its Valspar acquisition, which will create the world's largest paint and coatings company. I expect to see a marked shift in the merged company's capital allocation policies, with debt repayment and dividends gaining importance over buybacks. Visa, for its part, spent a whopping $7 billion on share buybacks just last year. The company spent a staggering $25.6 billion on repurchases versus only $5.4 billion on dividends between 2011 and 2016. That's not to say Visa's dividends haven't grown -- they've more than tripled since 2011 (adjusting for its 4-for-1 stock split in 2015), and its payout ratio has gone up from 12% to around 20% during the period. However, management intends to maintain its payout ratio between 20%-25% going forward. Among the three stocks, Advance Auto Parts' management clearly needs to display greater commitment toward shareholders. Its strong cash flow offers enough room for the company to bump up its dividends. Income investors may be able to find greater value in Sherwin-Williams and Visa in the coming years. Both are incredibly strong companies, with solid fundamentals and growth catalysts, making them great long-term buys for any investor. While Sherwin-Williams' global footprint should expand substantially after its merger with Valspar, Visa is poised to benefit tremendously from the global secular shift from cash to digital payments. As these companies grow, so should their dividends.